Having a home garden provides the opportunity to expose children to a little bit of basic Science. They are already naturally curious and this sets up a perfect opportunity to explain to them the basic needs of plants such as water, sunlight and nutrients. A home garden can also act as a family project. To make the gardening experience enriching, have the kids grow their own fruit and vegetable patch. Knowing how their food grows and where it came from encourages them to eat their fruits and vegetables and when you’re done you can get in touch with a skip bin hire at Western Suburbs or a service that is more local to you to help with the clean up. If you have a backyard, that’s great! If you don’t, it’s not a problem either. Starting a home garden in a small space is possible. You just need to figure out which containers or pots work best for the type of plant you’re planning to grow with your child. Among the options for containers or pots are repurposed old tires, a wheelbarrow, a sandbox or a wooden crate. Basically, any container you can grow things in with good drainage to prevent the plants from drowning and roots from rotting. The gardening spot can be set up at the corner of the balcony if you don’t own a lawn. The most important thing to look out for is the amount of sunlight in your chosen gardening spot. For a fruiting plant to thrive, it needs plenty of sunlight other than good soil and comfortable growing space. If you decide to set up a gardening spot for your child, remember that it’s for your child. Parents sometimes expect perfection and end up taking over the child’s project or activity. 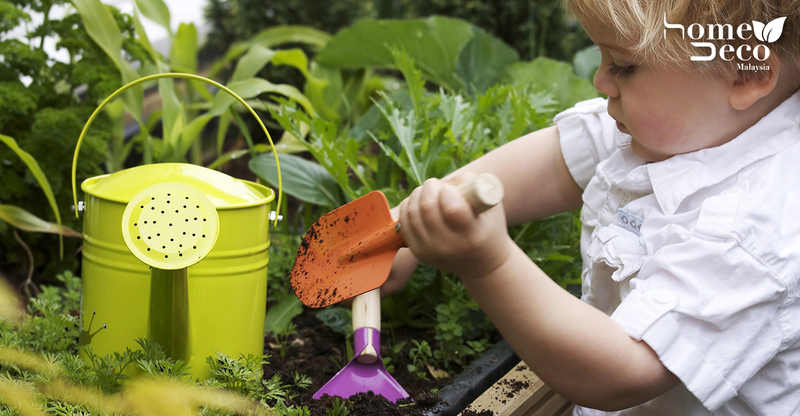 To sow gardening interest in a child, let them decide on a gardening theme. It can be a fairy garden like the one in Barbie: Fairytopia, a miniature dinosaur habitat or a paradise island with water features and plants that attract butterflies. Let them go crazy with it! It has to hold their attention and passion after all. Once you have a theme in place, you can then do the legwork and make sure you have all the right grow equipment to help make their dreams become a reality. A place for fairies to hangout. Decor don’t need to be big. The adults can help them decorate the corner by doing DIY projects such as making windchimes, painting mini fences, building an insect hotel, a fairy house or setting up a bird feeder. It can also be as simple as painting rocks for fairies to perch on. It’s the perfect opportunity for adults to indulge in kiddy fantasies! Take the opportunity while you can! Eeek! Nothing is worse when their first plants don’t grow well. While you study up how to grow the vegetables, let them start by decorating a terrarium or germinating some green beans first. To grow the beans, you need a small container, a few green beans and a damp cotton wool. Growing green beans is also a good way to ignite their curiosity in gardening. Fruiting plants that are easy to grow are tomatoes, ngaku or Arrowhead, and carrots. The other plants that can be grown easily in a small space are listed here. The reason to cultivate plants that germinate quickly is to manage a child’s short attention span and to keep them interested. Let kids have a sense of ownership by teaching them how to maintain and keep their plants alive. Maintenance includes weeding, watering, pruning and pest control such as watching out for snails and bugs like mealybugs. Bonus tip: To get rid of mealybugs, spray mild soapy water on the leaves. To prevent snails from chomping on your plants, scatter broken pieces of eggshells at the base of the plants. The pointy edges discourage snails from coming close. Nothing is more frustrating than using adult tools with small hands. Getting them their own tools also promotes independence and teaching them to care for their tools teaches them responsibility. Of course, the adult tools can be used when need be. Knowing how their food grows and where it came from encourages them to eat their harvest. By having the kids grow their own vegetables, parents already cut the mealtime drama in half. Getting them to harvest their own crops allows them to see and enjoy the fruits of their labour. For those who have started their home vegetable garden with their kids, help other families out by sharing how you went about it in the comments!